Context: Since mechanisms of microRNAs (miRNAs) in gastric cancer stem cells (CSCs) and their signaling pathways remain unknown, our aim was to predict the miRNA target genes that differentially expressed in gastric CSCs. Subjects and Methods: Using miRanda, PicTar, and TargetScan algorithm, target genes of miRNAs differentially expressed in gastric CSCs versus parental cells were predicted. Afterward, signaling pathways and biological functions of miRNAs in gastric CSCs were analyzed by the Database for Annotation, Visualization and Integrated Discovery (DAVID) database and DIANA tools. Results: Gene ontology (GO) tool indicated that most of miRNA target genes involved in regulation of cell cycle, apoptosis, cell migration, vasculogenesis, angiogenesis, etc. Some of miRNA target genes are connected to pivotal signaling pathways of the “stem cell genes,” such as Notch, Wnt/β-catenin. Conclusions: Bioinformatics analysis such as DAVID database, GO biological process, GO molecular function, Kyoto encyclopedia of genes and genomes pathways, BioCarta pathway, Panther pathway, and Reactome pathway revealed that target genes of differentially expressed miRNAs in gastric CSCs were connected to pivotal biological pathways that involved in cell cycle regulation, stemness properties, and differentiation. Gastric cancer, next to the lung cancer, is one of the most common cancer mortalities in the world. In spite of advances in several diagnostic techniques, gastric cancer routinely uncovered in advanced stages and survival rate of patients was relatively small. Due to a lack of profound understanding of the molecular mechanism of gastric cancer, the treatment of gastric cancer remains a challenging problem. Cancer stem cells (CSCs), the rare subpopulation of tumor cells that possess self-renewal ability, extensive proliferation, drug resistance, and high tumorigenic capacity, are considered as tumor-initiating cells and responsible for recurrence, metastasis, and resistance to anticancer therapy. Several studies showed that many signal pathways including sonic hedgehog homolog (SHH), Wnt/β-catenin, Notch, epidermal growth factor (EGF), transforming growth factor (TGF)-β, mitogen-activated protein kinase (MAPK), mammalian target of rapamycin (mTOR), Janus kinase/signal transducer and activator of transcription (JAK-STAT), and bone morphogenetic protein (BMP) signaling pathway may be participated in the regulation of CSC growth and functions.,,,,,,,, miRNAs participate in different biological processes (BPs) of CSCs, including self-renewal and differentiation via hedgehog, Wnt/β-catenin, Notch, mTOR, EGF, TGF-β, and BMP signaling pathways by targeting CSC-related signaling molecules. Since fundamental mechanisms of miRNAs in gastric CSCs at the molecular level and their signaling pathways remain unknown, our aim was to predict the miRNA target genes that differentially expressed in gastric CSCs and analysis of miRNA functions, BPs, and CSCs-related signaling pathways in cellular processes such as self-renewal, apoptosis, migration, and differentiation through hedgehog, Wnt/β-catenin, Notch, mTOR, EGF, TGF-β, and BMP signaling pathways. The differential miRNA expression profiles in spheroid body-forming cells in comparison with their parental MKN-45 cells were taken from microarray data analysis by Liu et al. We identified targets of differentially expressed miRNAs and then analyzed their signaling pathways by Database for Annotation, Visualization and Integrated Discovery (DAVID) knowledge base and DIANA tools. Three online software programs, TargetScan (http://www.targetscan.org) with context score <−0.2, PicTar (http://www.pictar.org/cgi-bin/PicTar_vertebrate.cgi), and miRanda (score <−0.5) algorithms (http://www.microrna.org/), were used to predict targets of differentially expressed miRNAs in MKN-45 CSCs. We used miRCancer database (http://mircancer.ecu.edu/) to find miRNAs that had published in PubMed. Then, validated miRNA-target interactions database was aggregated by miRWalk (www.umm.uni-heidelberg.de/apps/zmf/mirwalk/). We used DIANA, a miRNA pathway analysis web-server (http://diana.imis.athena-innovation.gr), and DAVID tools (http://www.david.abcc.ncifcrf.gov/) to analyze the function of differentially expressed miRNA targets and CSCs-related signaling pathways. 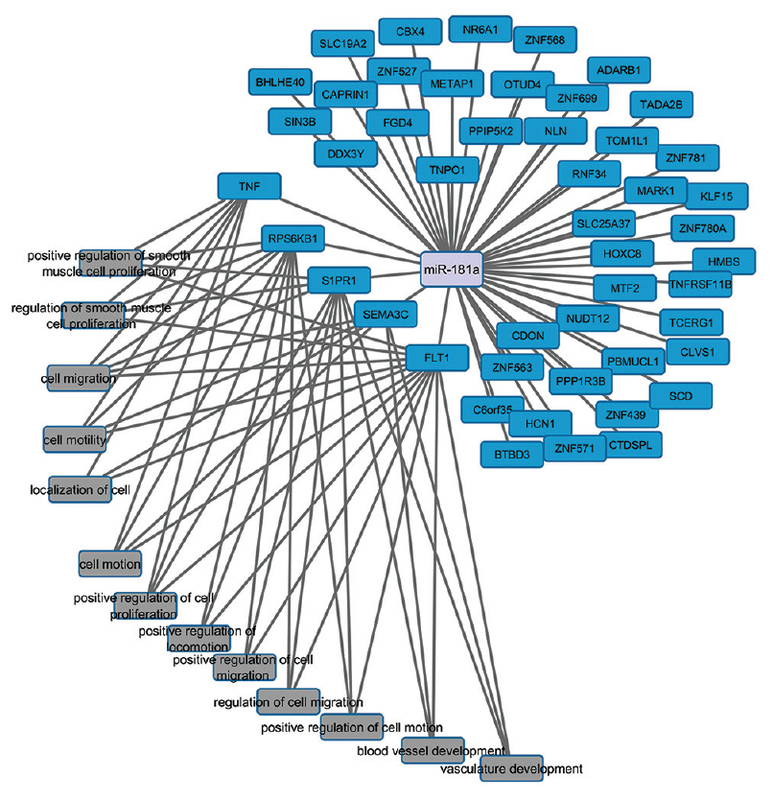 DAVID provides a set of data-mining tools including gene ontology (GO) BP, GO molecular function (MF), Kyoto encyclopedia of genes and genomes (KEGG) pathway, BioCarta pathway, Panther pathway, and Reactome pathway. Target lists of miRNAs were submitted to DAVID tools and selected Homo sapiens species. Then, to avoid too many target genes, the “human cancer biology array” was chosen in background tab module in the DAVID database. We got results of GO BP, GO MF, KEGG, BioCarta, Reactome, and Panther pathway for 173 miRNA genes. Moreover, we used the statistically significant threshold at P ≤ 0.05 and our analysis was focused on signaling pathways and biological functions that may be regulated by miRNAs in MKN-45 CSCs. The results of DAVID database were showed either with considering P value (98 miRNAs) or without regarding P value (173 miRNAs). DIANA-TarBase v6. (http://www.microrna.gr/tarbase) the largest available database aiming to catalogue published experimentally validated miRNA:gene interactions. However, we did not obtain any results for some miRNAs by DIANA-TarBase v6.0; therefore, DIANA-microT-CDS algorithm was selected to use miRNA targets prediction in CDS or 3'-untranslated region regions. We analyzed CSCs-related signaling pathways in several cellular processes such as self-renewal, apoptosis, migration, and differentiation through hedgehog, Wnt/β-catenin, Notch, mTOR, TGF-β, and BMP signaling pathways with regarding P value and the statistically significant threshold adjusted at P ≤ 0.05. The differentially expressed miRNAs in spheroid body-forming cells were taken from microarray data by Liu et al. Target genes of miRNAs were identified by three prediction software programs such as TargetScan, PicTar, and miRanda. However, these three programs did not identify nine miRNA target genes (hsa-mir-5571-5p/5195-3p/5010-3p/5001-5p /4666b/3675-3p). 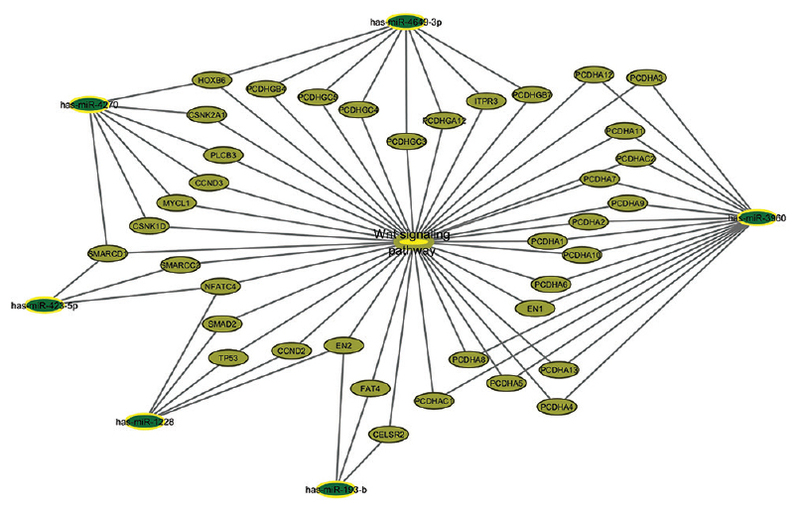 These nine miRNAs were removed from differentially expressed miRNAs list for further analysis. Target genes of remained miRNAs were filtered out with the use of the “human cancer biology array” and submitted to DAVID tools. We retrieved 182 differentially expressed miRNAs from miRCancer database and found that 44 miRNAs had published in PubMed. Validated miRNA-target interactions database that aggregated by miRWalk. GO BP and GO MF module in the DAVID database were used for analysis of miRNA target genes. We arranged the miRNA-GO BP interactions and made a network using CytoScape to predict miRNA target genes and target genes-GO BP interactions for some of the miRNAs expressed in gastric CSCs with statistically significant at P ≤ 0.05. GO BP analysis data showed most of the miRNA target genes that associated with CSCs process involved in the regulation of cell growth, cell cycle and mitosis, cell proliferation, anti-apoptosis, cell migration and locomotion, vasculogenesis, and angiogenesis. For example, miR-181a target genes may be take part in positive regulation of cell proliferation and cell migration, locomotion, and vasculogenesis [Figure 1]. In addition, some target genes were connected to MAPKKK cascade, JAK-STAT cascade, MAPK activity, Wnt receptor signaling pathway, etc. Moreover, the target genes related to gastric CSCs miRNAs may participate in multiple GO MF classification, such as protein kinase activity, tumor necrosis factor receptor superfamily binding, transcription factor activity, growth factor binding, transcription coactivator activity, and other functions such as GTPase activity, guanosine triphosphate binding, differentiation, DNA binding, adenyl ribonucleotide binding. Function and signaling pathway analysis of miRNA target genes were performed by Panther signaling pathway module in the DAVID database at P ≤ 0.05. Most of these targets were related to the Wnt signaling, platelet-derived growth factor (PDGF) signaling, angiogenesis, EGF receptor signaling, Ras signaling, and fibroblast growth factor (FGF) signaling. 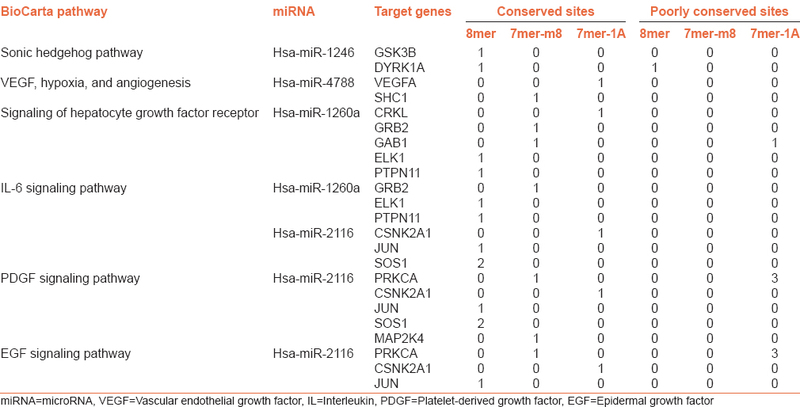 Summary of these signaling pathways related to miRNAs expressed differentially and their target genes is shown in [Table 1]. For example, Panther pathway indicated that 6 miRNAs including miR-193b, miR-423-5p, miR-1228, miR-3960, miR-4270, and miR-4649-3p may be take part in Wnt signaling pathway [Figure 2]. KEGG provides the annotation of function and pathway analysis of target genes. We employed KEGG to identify several metabolic signaling pathways and related target genes including apoptosis signaling, MAPK signaling, Wnt signaling, and ErbB signaling. Results of KEGG signaling pathway were set at P ≤ 0.05 and a part of signaling pathways of miRNA target genes is shown in [Table 2]. For example, KEGG tools showed that target genes of miR-27a were probably involved in MAPK and ErbB signaling pathways. 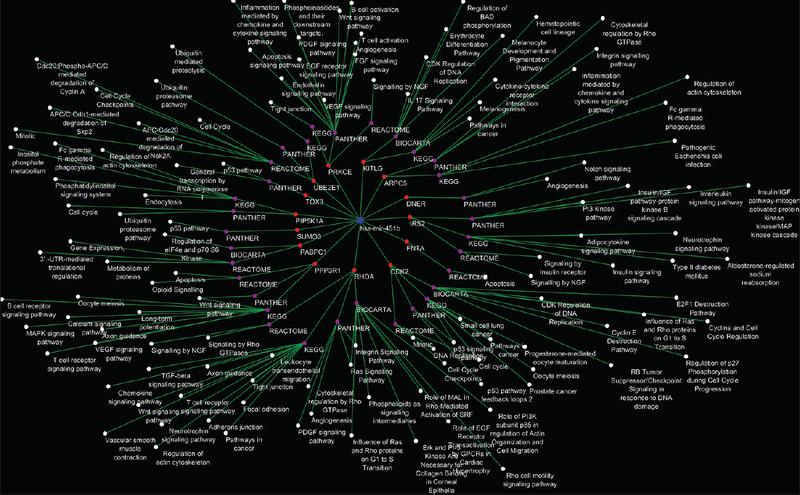 We used the BioCarta and Reactome pathways to conduct pathway analysis prediction. Some of these targets were found to be involved in SHH pathway, vascular endothelial growth factor (VEGF), hypoxia, angiogenesis, interleukin 6 signaling, PDGF signaling, EGF signaling, insulin-like growth factor (IGF)-1 signaling pathway, cell cycle and mitotic, BMP signaling, TGF-β signaling, nerve growth factor (NGF) signaling, etc. By merging these data, a part of BioCarta and Reactome signaling pathways and miRNA target genes are shown in [Table 3] and [Table 4], respectively. We also used functional annotation table in the DAVID database to analyze signaling pathway, GO MF, and GO BP of all target genes. For instance, signaling pathway of hsa-mir-451b is shown in [Figure 3]. Among 173 miRNAs that were analyzed by DAVID tools, 98 miRNAs had P ≤ 0.05. The miRNAs with P ≤ 0.05 were uploaded to DIANA tool. Two miRNAs, hsa-mir-1228 and hsa-mir-3612-3p, were not included in this database and were excluded from a query. We selected DIANA-TarBase for 96 miRNAs, but we did not find any results for some miRNAs; therefore, we selected DIANA-microT-CDS for analysis. We set the threshold at P ≤ 0.05 and analyzed miRNAs and their target genes for all miRNAs. For instance, DIANA tools indicated that miR-20a-5p may be involved in TGF-β, Wnt, MAPK, and mTOR signaling pathways. miRNAs play important roles in several biological functions such as apoptosis, differentiation, cellular proliferation, and many other important functions. In this study, we explore the roles of the miRNAs that differentially expressed in MKN-45 gastric CSCs by bioinformatics tools. Therefore, we set 182 differentially expressed miRNAs in MKN-45 gastric CSCs in contrast to their parental MKN-45 cells from microarray data analysis. Microarray results of differentially expressed miRNAs that performed by Liu et al. indicated that among 1887 human miRNAs, 182 miRNA were differentially expressed in the gastric CSCs versus their parental MKN-45 cells. Of 182 miRNAs differentially expressed in microarray results, 9 miRNAs were upregulated and 173 miRNAs were downregulated. These results of microarray analysis were demonstrated that 9 miRNAs may be considered as oncogenes and 173 miRNAs as tumor suppressor genes. Quantitative real-time polymerase chain reaction of 10 miRNAs by Liu et al. indicated that the concordance rate of microarray results was 70.0%. Target genes of differentially expressed miRNAs were predicted in gastric CSCs by three online prediction software algorithms, TargetScan, PicTar, and miRanda, but these two programs did not identify target genes for 9 miRNA. Due to a lack of deep understanding of the molecular mechanism of gastric cancer and roles of miRNAs in gastric CSCs, we analyzed biological function and signaling pathways of 173 miRNAs by DAVID and DIANA tools. DAVID tools including GO BP, GO MF, KEGG pathway, BioCarta pathway, Panther pathway, and Reactome pathway were employed to enrich and analyze function of the differentially expressed miRNA target genes in gastric CSCs. We found that differentially expressed miRNAs in gastric CSCs may be take part in many important BPs, such as regulation of cell growth, cell cycle regulation, apoptosis, cell proliferation, cell migration, locomotion, mitosis, vasculogenesis, and angiogenesis. Moreover, these differentially expressed miRNA target genes participate in some important signaling pathways in CSCs such as hedgehog, Notch, EGF, TGF-β, Wnt/β-catenin, MAPK, mTOR, and JAK-STAT signaling pathways. The CSCs play important roles in cancers development including tumor formation, metastasis, recurrence, and resistance to traditional therapy. On the other hand, hedgehog signaling, Wnt signaling, Notch signaling, EGF signaling, and TGF-β and BMP signaling are regarded as signaling pathways for self-renewal and differentiation of gastric CSCs.,,,,,,,, Hence, the study of the biological functions of CSCs is very important for therapeutic manipulation. Results of miRCancer database indicated that 44 differentially expressed miRNAs had published in PubMed. Results of these published literature concurred with our results that obtained by bioinformatics analysis. For instance, aberrant of miR-378a-3p or miR-378a-5p expression prevented cell proliferation, induced apoptosis and colony formation in colorectal cancer cells and Panther pathway tool results showed that target genes of miR-378a probably regulated insulin/IGF pathway-MAPKK/MAPK cascade. Downregulation of miR-940 suppressed prostate cancer migration and invasion and results of Panther pathway tools showed that target genes of miR-940 may be take part in PDGF signaling pathway. MiR-29b-1-5p was downregulated in mesenchymal cancer and its absence probably contributed to sarcoma tumorigenesis and results obtained by KEGG pathway and GO BP tools showed target genes of miR-29b were probably involved in focal adhesion and tube development. Mir-1246 was expressed significantly higher in primary colon cancer cell lines than a normal colon-derived cell line and BioCarta pathway tool results showed that mir-1246 target genes take part in SHH pathway. Database of miRCancer reveals miR-30a-5p was downregulated in gastric carcinoma and DIANA tools indicated that miR-30a-5p may be take part in hedgehog, Notch, TGF-β, Wnt, MAPK, and mTOR signaling pathways. Altogether, we analyzed BP, MF, and signaling pathways of miRNA target genes in gastric CSCs and their interaction by DAVID tools, BioCarta, Panther pathway tools, and DIANA tools. BioCarta pathway tools showed one miRNA may be take part in SHH, one miRNA in VEGF, one miRNA in hypoxia, one miRNA in angiogenesis, and one miRNA in EGF signaling pathways. KEGG pathway tools revealed that 1, 2, 3, and 4 miRNAs may be involved in apoptosis, MAPK, Wnt, and ErbB signaling pathways, respectively. Panther pathway tools indicated that 2 miRNAs probably take part in insulin/IGF pathway in MAPK signaling and 2 miRNAs in PDGF signaling pathways and one miRNA may be involved in both FGF and EGF receptor signaling pathway. Panther pathway tools predicted that 6 miRNAs involved in Wnt signaling pathway. Reactome pathway tools indicated that 2 miRNAs may be involved in signaling by NGF and one miRNA may be involved in both signaling by BMP and TGF-β. DIANA tools indicated that 17, 15, 23, 26, 30, and 20 miRNAs may be regulated hedgehog, Notch, TGF-β, Wnt, MAPK, and mTOR signaling pathways, respectively. Bioinformatics analysis revealed that target genes of differentially expressed miRNAs in gastric CSCs were connected to pivotal biological pathways that involved in cell cycle regulation, stemness properties, and differentiation. We would like to acknowledge and extend our gratitude to Homeyra Seydi for her contribution in completing this work. Hime GR, Somers WG. Micro-RNA mediated regulation of proliferation, self-renewal and differentiation of mammalian stem cells. Cell Adh Migr 2009;3:425-32. Ivey KN, Srivastava D. MicroRNAs as regulators of differentiation and cell fate decisions. Cell Stem Cell 2010;7:36-41. Cheng AM, Byrom MW, Shelton J, Ford LP. Antisense inhibition of human miRNAs and indications for an involvement of miRNA in cell growth and apoptosis. Nucleic Acids Res 2005;33:1290-7. Calin GA, Sevignani C, Dumitru CD, Hyslop T, Noch E, Yendamuri S, et al. Human microRNA genes are frequently located at fragile sites and genomic regions involved in cancers. Proc Natl Acad Sci U S A 2004;101:2999-3004. Chen G, Shen ZL, Wang L, Lv CY, Huang XE, Zhou RP. Hsa-miR-181a-5p expression and effects on cell proliferation in gastric cancer. Asian Pac J Cancer Prev 2013;14:3871-5. Akao Y, Nakagawa Y, Naoe T. Let-7 microRNA functions as a potential growth suppressor in human colon cancer cells. Biol Pharm Bull 2006;29:903-6. Yang Z, He M, Wang K, Sun G, Tang L, Xu Z. Tumor suppressive microRNA-193b promotes breast cancer progression via targeting DNAJC13 and RAB22A. Int J Clin Exp Pathol 2014;7:7563-70. Lewis BP, Burge CB, Bartel DP. Conserved seed pairing, often flanked by adenosines, indicates that thousands of human genes are microRNA targets. Cell 2005;120:15-20. Yu J, Feng J, Zhi X, Tang J, Li Z, Xu Y, et al. Let-7b inhibits cell proliferation, migration, and invasion through targeting Cthrc1 in gastric cancer. Tumour Biol 2015;36:3221-9. Lopes-Ramos CM, Habr-Gama A, Quevedo Bde S, Felício NM, Bettoni F, Koyama FC, et al. Overexpression of miR-21-5p as a predictive marker for complete tumor regression to neoadjuvant chemoradiotherapy in rectal cancer patients. BMC Med Genomics 2014;7:68. Wang X, Yu H, Lu X, Zhang P, Wang M, Hu Y. MiR-22 suppresses the proliferation and invasion of gastric cancer cells by inhibiting CD151. Biochem Biophys Res Commun 2014;445:175-9. Franchina T, Amodeo V, Bronte G, Savio G, Ricciardi GR, Picciotto M, et al. Circulating miR-22, miR-24 and miR-34a as novel predictive biomarkers to pemetrexed-based chemotherapy in advanced non-small cell lung cancer. J Cell Physiol 2014;229:97-9. Gomceli I, Demiriz B, Tez M. Gastric carcinogenesis. World J Gastroenterol 2012;18:5164-70. Martin J, Donnelly JM, Houghton J, Zavros Y. The role of sonic hedgehog reemergence during gastric cancer. Dig Dis Sci 2010;55:1516-24. Cai C, Zhu X. The Wnt/ß-catenin pathway regulates self-renewal of cancer stem-like cells in human gastric cancer. Mol Med Rep 2012;5:1191-6. Yeh TS, Wu CW, Hsu KW, Liao WJ, Yang MC, Li AF, et al. The activated Notch1 signal pathway is associated with gastric cancer progression through cyclooxygenase-2. Cancer Res 2009;69:5039-48. Howard BM, Gursel DB, Bleau AM, Beyene RT, Holland EC, Boockvar JA. EGFR signaling is differentially activated in patient-derived glioblastoma stem cells. J Exp Ther Oncol 2010;8:247-60. Miyazono K, Suzuki H, Imamura T. Regulation of TGF-beta signaling and its roles in progression of tumors. Cancer Sci 2003;94:230-4. Boutros T, Chevet E, Metrakos P. Mitogen-activated protein (MAP) kinase/MAP kinase phosphatase regulation: Roles in cell growth, death, and cancer. Pharmacol Rev 2008;60:261-310. Martin EC, Rhodes LV, Elliott S, Krebs AE, Nephew KP, Flemington EK, et al. MicroRNA regulation of mammalian target of rapamycin expression and activity controls estrogen receptor function and RAD001 sensitivity. Mol Cancer 2014;13:229. Boudny V, Kovarik J. JAK/STAT signaling pathways and cancer. Janus kinases/signal transducers and activators of transcription. Neoplasma 2002;49:349-55. Owens P, Pickup MW, Novitskiy SV, Giltnane JM, Gorska AE, Hopkins CR, et al. Inhibition of BMP signaling suppresses metastasis in mammary cancer. Oncogene 2015;34:2437-49. Xia M. Great potential of microRNA in cancer stem cell. J Cancer Mol 2008;4:79-89. Li H, Dai S, Zhen T, Shi H, Zhang F, Yang Y, et al. Clinical and biological significance of miR-378a-3p and miR-378a-5p in colorectal cancer. Eur J Cancer 2014;50:1207-21. Rajendiran S, Parwani AV, Hare RJ, Dasgupta S, Roby RK, Vishwanatha JK. MicroRNA-940 suppresses prostate cancer migration and invasion by regulating MIEN1. Mol Cancer 2014;13:250. Balkhi MY, Iwenofu OH, Bakkar N, Ladner KJ, Chandler DS, Houghton PJ, et al. miR-29 acts as a decoy in sarcomas to protect the tumor suppressor A20 mRNA from degradation by HuR. Sci Signal 2013;6:ra63. Ogata-Kawata H, Izumiya M, Kurioka D, Honma Y, Yamada Y, Furuta K, et al. Circulating exosomal microRNAs as biomarkers of colon cancer. PLoS One 2014;9:e92921. Li X, Zhang Y, Zhang H, Liu X, Gong T, Li M, et al. miRNA-223 promotes gastric cancer invasion and metastasis by targeting tumor suppressor EPB41L3. Mol Cancer Res 2011;9:824-33.